One does not have to look far for reasons that people should be singing. Research-based associations between choral singing and wellness are bountiful, and the experience of being in a choir has been shown to be powerful for community-building. Group music-making has the potential to bring people together from different walks of life, which combats the effects of a stratified society. The Creek Choir supports Creek College’s mission of physically engaging with the place of the creek by bringing community life to the creek bed. In an age where humans seem to live in opposition to nature, the Creek Choir provides a space to be near to the earth. By bringing this musical practice to Greensboro’s natural environment, we reestablish the outdoors as a place of community life. The Creek Choir welcomes singers with any amount of musical background, from those who say they have no musical experience, to those who consider themselves professionals. Our repertoire will be related to themes of ecology and community life. A two day class pointing to the age-old adage, “you could not step twice into the same river,” made famous by Heraclitus, a pre-socratic greek philosopher of the sixth century BC. A poetic interaction with the creek spanning two days wherein participants collected water at the confluence of Johnson Creek (based on the amount of water displaced by their foot) and gathered a week later at the headwaters to pour it back in, giving it a second chance to flow. An introduction to the art of bookmaking and binding with a focus on the history of nature journals. Books were created and used to collect information on plant and animal species around the Johnson Creek. Taught by artists Lauren Moran and Erika Dedini. Our urban soundscape is quite often jarring—a cacophony of sounds from construction, traffic, and other mechanical and human elements. City parks offer some buffer to this anxiety-inducing reality, and provide new combinations of sonic elements. Participants took decibel readings, made field recordings and produced visual maps documenting the sonic space. Taught by artist/composer Lisa Schonberg. Listen to the field recordings here! Participants explored earth materials — clay (a soft, pliable, sedimentary material) and plaster (a soft mixture of gypsum) to create a one of a kind bas-relief. Bas-relief is a method of sculpting that is closest to drawing. It is a shallow three-dimensional composition created on a flat surface. 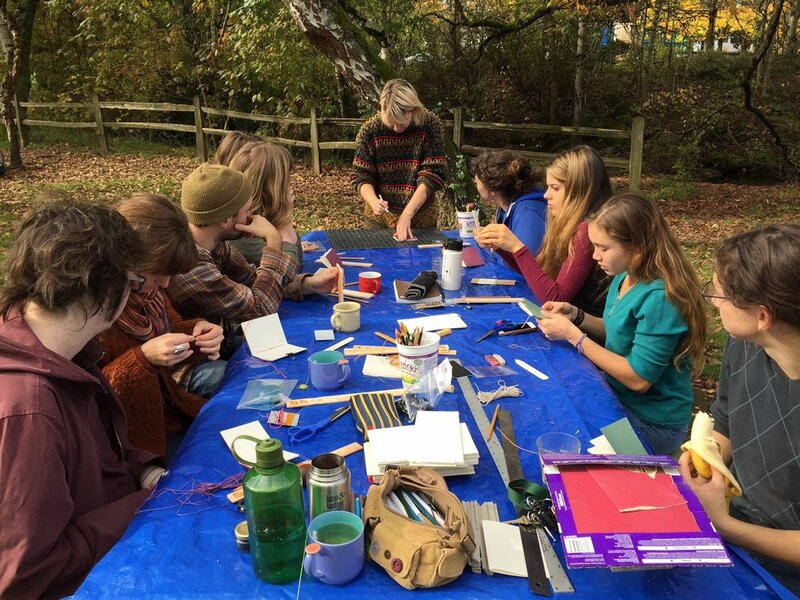 In this class participants studied the Johnson Creek's local flora and fauna to draft their concepts through sketches. From the sketches, they sculpted clay using a subtractive and additive method to create a mold. Once the clay was sculpted, a plaster bas-relief was created from the clay bringing their concepts to fruition.